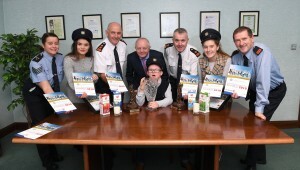 The Lee Strand/Kerry Garda Youth Achievement Awards 2018 was officially launched recently in Lee Strand in Tralee. The awards are held for youths between the ages of thirteen and twenty one years and recognise the great contribution young people have made and continue to make to their communities in Kerry. The awards will be presented at a celebratory awards ceremony in the Ballyroe Heights Hotel, Tralee on Friday, January 25th, 2019. This year twenty Merit Awards will be presented to individuals who have made a positive contribution to their community and make it a better place to live. A Group Award will also be presented to groups of two or more people who have made an impact to their community. The Special Achievement Award will be presented to an individual who has overcome difficult circumstances, has defied all the odds and whose commitment deserves recognition. A Community Safety Award will be presented to an individual who through crime prevention or a safety initiative/innovation has made their community a safer place to live. The Overall Winner of the Lee Strand/Kerry Garda Youth Achievement 2018 will also be presented.